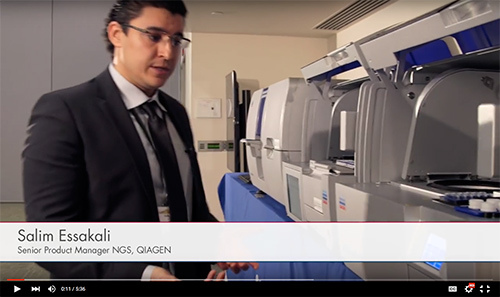 Qiagen reports that an evaluation by the Broad Institute of MIT and Harvard has affirmed the performance of its GeneReader NGS system in detecting gene variants known to be clinically relevant in colorectal cancer. Product data compared favorably with the company’s therascreen RAS mutation tests based on real-time qPCR and pyrosequencing, as well as with a NGS workflow using a competitor’s sequencer, according to Qiagen. All of the methods were used to test the same 43 tumor samples of confirmed metastatic colorectal cancer from FFPE as sample material. The GeneReader workflow also identified additional aberrations, enabling a more comprehensive investigation of clinically actionable variants (e.g., in the BRAF-gene), explained a Qiagen official, adding that because the data generated by the GeneReader had fewer FFPE artifacts, it rendered a more accurate reflection of genuine somatic mutations in the samples.